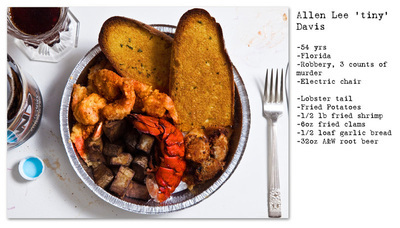 A group of screenwriters each share their perspectives on an inmate's final meal. 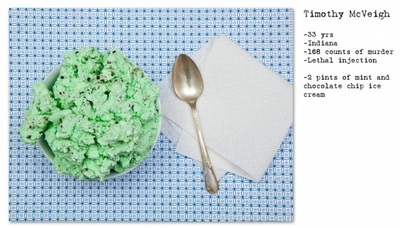 Henry Hargreaves is a New Zealand photographer who recreated the last meal plates of death row inmates in a series called "No Seconds." I am gathering a group of screenwriters and will give each a photo of a plate and a short biography of the inmate. 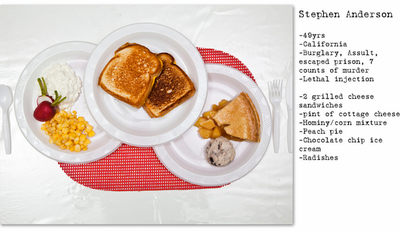 Each screenwriter has the same setting: a prison cell, a table, and a plate of food. Each screenwriter will write a 3-10 minute script depicting the thoughts, actions and flashbacks of the inmate as they sit down to their final meal. I will then look for a way to tie all short pieces into one film. We will read and consider EVERY script that is submitted and then use the ones that seem to work well together in the narrative of the film. Q) Do you have any sort of guidelines as far as what you are looking for...or is it just open to interpretation? A) Each writer's piece is entirely open to their interpretation...a mix of genres, styles (comedy, horror, drama, etc.) time periods and perspectives will be what makes this an interesting project. Every scene will be primarily set in a prison cell as a death row inmate sits down to his/her last meal. The plate of food will play an important role in every scene. Screenwriters may employ any story telling technique such as flashbacks and monologue for their scene. A) If you are interested, choose a picture and bio from this SITE and write a 3-10 minute script about that character's last meal. Please keep the contents of the plate the same as the photo but change the details about the person from what is listed including gender, age, crime, location and name. The plate must play an important role, as if it is almost a character, a reflection of the inmate. In the film's present, the character is limited to his or her cell but his imagination or flashbacks can take him anywhere. You may also choose to NOT include flashbacks or the character's imagination. Scripts can be sent to lijfilms@gmail.com All scripts will be reviewed and you will retain your copyright should your script not be chosen for inclusion in the project. Q) How much will I be paid? We do not have a budget, so we cannot afford to pay you a thing but, dang it, we will be truly appreciative and keep you involved throughout the project. Q) When will you be casting? When will you be filming?